Just a great big thank you to everyone who came out this past Friday for the opening of Inner and Outer Space. All nine artists and the entire MF staff worked extremely hard (and late into the night) to make sure this show would not disappoint. And it doesn't. But don't take our word for it...come see for yourself. 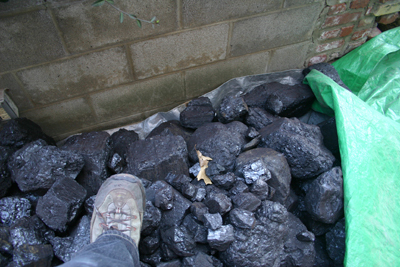 Images of the final, complete installations should be posted this week or early next, so stay tuned. 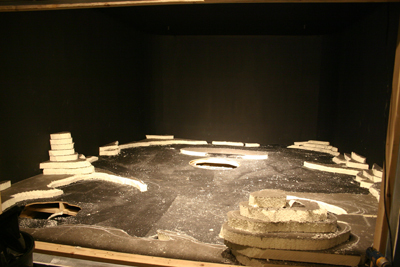 Inner and Outer Space runs through January 11, 2009. Illustrations of Catastrophe and Remote Times is reviewed by Melissa Kuntz in this week's Pittsburgh City Paper. The current manifestation of the "Gestures" series at the Mattress Factory, intriguingly titled Illustrations of Catastrophe and Remote Times, includes artworks and installations by 21 participants, not all of whom (as per the series' premise) were trained as visual artists. They include a graphic designer, a robotics researcher, a musician, a window designer and a doll maker. JUST ANNOUNCED: Illustrations of Catastrophe and Remote Times is extended through June 15, 2008. We're really excited to announce that the museum is now offering a Green, paperless membership. All correspondence (event/exhibition invites, newsletters, coupons, admission passes, etc.) will be sent electronically, freeing up more of your membership dollars to directly support the art, not postage and printing costs. No paper. Ever. We promise! And at $50 per year, the Green Membership is just about 30% cheaper than our standard individual membership. 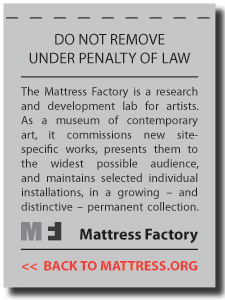 Visit http://www.mattress.org/green to learn more and check out all the benefits that come with a Mattress Factory membership. By the way, if you live in Pittsburgh, set your TiVos for WTAE (Channel 4) at 5.00PM this evening. News anchor Kelly Frey was here this morning doing a story on our Green Membership and next week's Ecolution event. Make sure to tell Lindsay you saw her on Tee Vee. 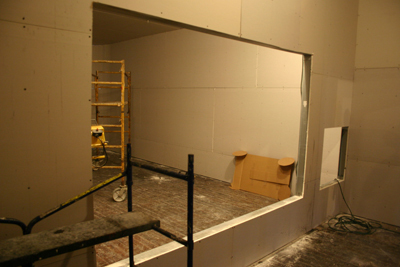 Below are some shots documenting the progress of Tavares Strachan's piece on the third floor. 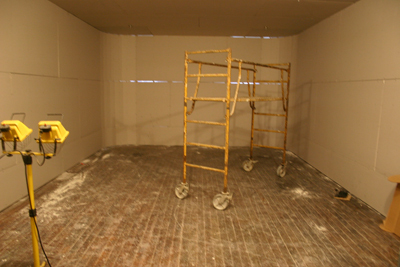 It's hard to believe that this is the same space that housed Anita Dube's Five Words during INDIA: New Installations, Part II. 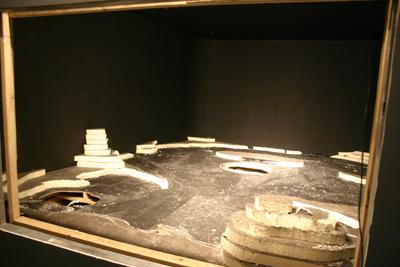 For Tavares' piece, an area of the third floor is being converted into a diorama of a desolate, dark planet on which a robot will traverse the surface. Museum visitors will be able to control the robot from a remote location outside of the building. Inner and Outer Space opens with a public reception at 6.00PM on Friday, April 25. 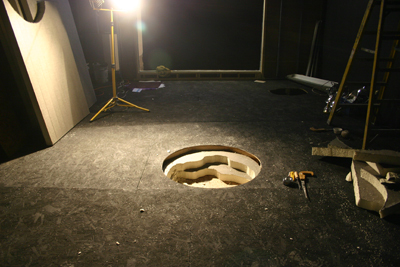 More photos of works in progress can be found on our FLICKR page. It's been a crazy week at the museum. Installation of the new show is in full-swing and we're about to enter the busiest time of all -- the three weeks leading up to the opening. 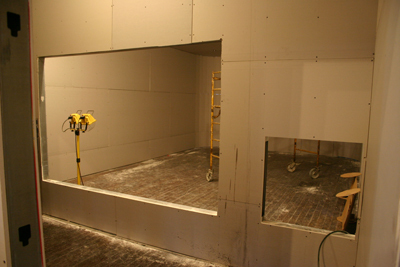 Our artist residence will basically be filled from now until the opening on April 25, as artists are now arriving to do the lion's share of the work. We've been shooting video and stills throughout and hope to post more process documentation pieces shortly. Stay tuned.